A View From The Cave: What Nations Will Grow the Most and Least in 2013? 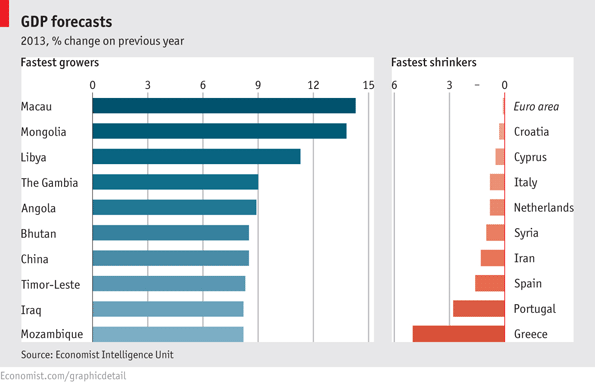 What Nations Will Grow the Most and Least in 2013? The Economist Intelligence Unit says gambling haven Macau will experience the most growth followed by a mix of countries like Mozambique and The Gambia. The countries listed at the top are situated in Asia and Africa while the slow growers will all be in Europe with (no surprises) Greece leading the field with the least amount of growth. One commentator on the post points out that Portugal is falling while four of its former colonies (Macau, Angola, Mozambique and Timor-Leste) are expected to grow.